UView 6x loading dye is a dual-action fluorescent nucleic acid stain and loading dye that allows for immediate visualization of DNA fragments after electrophoresis without the need for in-gel or post electrophoretic staining/destaining. While sensitive, it is also nontoxic and nonmutagenic, making it an attractive alternative to ethidium bromide. The UView 6x loading dye is best for DNA electrophoresis applications. 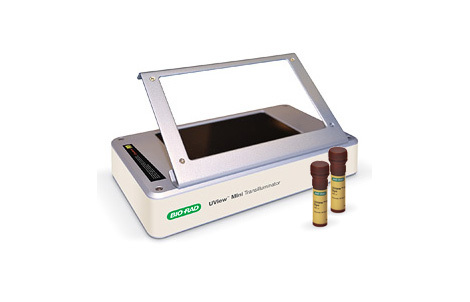 The UView transilluminator allows visualization of agarose gels at long wavelengths. The UView 6x mini transilluminator is best for fluorescent applications that require excitation at 365 nm.